Harrington and the other winners -- Leona and Lisa Maguire, who jointly receive the ‘Women’s Amateur of the Year’ award; Shane Lowry, winner of the ‘Men’s Amateur of the Year’; and Brendan Edwards, recipient of the ‘Distinguished Services’ -- will receive their awards at a dinner, sponsored by AIB Bank, which takes place in Dublin on 8th January, 2009. Harrington won the Claret Jug at Birkdale with a final round 69 for a 72-holes total of 283, which gave him a four stroke winning margin over England’s Ian Poulter. In retaining his Open championship title, the 37-year-old Dubliner joined an illustrious group that includes Arnold Palmer (1961-1962), Lee Trevino (1971-1972), Tom Watson (1982-1983) and Tiger Woods (2005-2006). In August, Harrington claimed his third career major when he finished with successive rounds of 66 for a final 72-holes total of 277, for a two shot winning margin over Spain’s Sergio Garcia and the USA’s Ben Curtis. 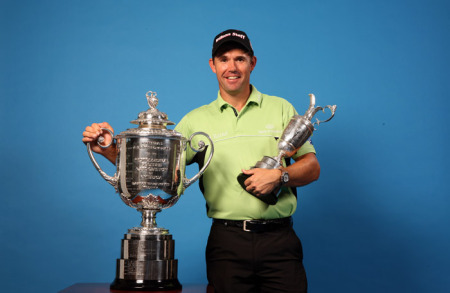 Harrington’s success was the first by a European since 1930 to win the Wanamaker Trophy. The Maguire twins, Leona and Lisa, dominated women’s golf between them: Leona won the Lancome Irish Women’s Close championship, defeating Lisa in the final; but Lisa was to gain a measure of revenge by defeating her sister in the Irish Girls’ Close championship and by also adding the prestige European Young Masters championship to her list of honours. Shane Lowry maintained his impressive amateur career with a fine 2008 that included individual wins in the West of Ireland amateur championship and the North of Ireland amateur championship, and he was also a key member of Ireland’s six-man team which retained the European Team Championship. Brendan Edwards, the recipient of the ‘Distinguished Services’ award, has served Irish golf magnificently as a player and administrator. As a player, he represented Ireland from 1961 to 1973 and won the North of Ireland amateur championship in 1973. He also captained Ireland to the European Team Championship in 1983 and served as a Walker Cup selector.